I know I'm doing it wrong, but I don't always knit gauge swatches. Even when I'm knitting sweaters. (Gasp.) Unless I'm designing something and even then, I usually just make a teeny-tiny swatch, which probably doesn't even count. But for the 30 Day Sweater Challenge, you get to design your own sweater using your own measurements so you really, really have to knit a swatch. Mine is still kind of wrong because I didn't make the garter stitch border but I did soak it and block it and then measured/counted my stitches with a ruler. The whole process didn't take long at all. It wasn't a huge pain. 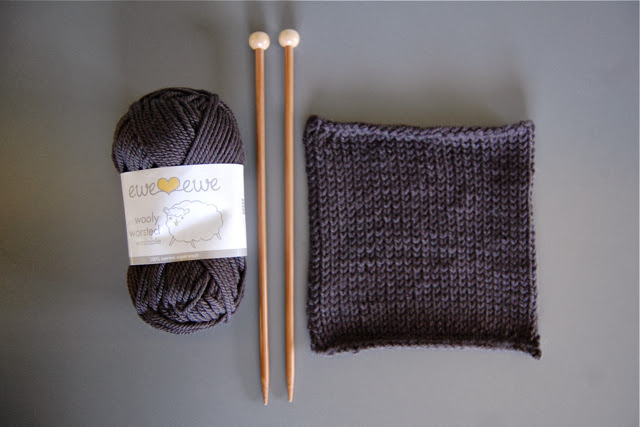 I'm glad I had a really good excuse to swatch because now I've reminded myself that it's not a big deal and I know swatching will absolutely save me a lot of time in the future if I become a 'good' swatcher and do this each time I knit. I know it's hard to resist diving right into a new project but I can definitely see the value of a swatch. Now that I know my gauge, I can plug those numbers into a formula that will become my own personal sweater pattern. And that is pretty cool. We are on Day 2 of the 30 Day Sweater Challenge, which means we've all made our sweater-making plans and swatches and I'm almost ready to cast on. I'm going to be knitting Bowie's sweater in Ewe Ewe Wooly Worsted in three colors – Brushed Silver, Sapphire and Orange Peel. (I know ... even the color names are cool.) Wooly Worsted is incredibly soft 100% merino and it's washable, so I know it will be the perfect yarn for a child's sweater. If you want to get in on the action and knit your own sweater, visit 30daysweater.com to download your free sweater planning guide. And visit NobleKnits.com during the month of October to get 15% off Ewe Ewe Wooly Worsted yarn! Use the code: 30DAYSWEATER at checkout. are you going to be knitting in new york to keep up?? Ha! When do you go to NY? I'm heading to PA in the middle of this! I don't go until the 17th. My parents live only about an hour outside the city. It would have been fun to try and swing something! Awesome! Love the names of the colors you ended up picking. But the real question is are you going to name the sweater just as epically?! Ack! Those colors are gorgeous. Gorgeous. I have never once knit a swatch. Or crocheted a swatch. I realize that's super bad, but I've also never had an issue with sizing. (she says as she knits her first sweater — it's supposed to be oversized, though so there is a lot of leeway!). I'm with you on this! I've always considered my guage to be pretty average and for the most part, patterns end up working out for me. But sometimes ... I wish I had just checked in the beginning. I definitely want to see this oversized sweater! I bet it will be awesome.